Everybody Works, the Oakland-via-Brentwood musician’s breakthrough, is a revelation that celebrates self-care, identity, and the Bay Area DIY scene on her own terms. But it took a bit of time to get there. 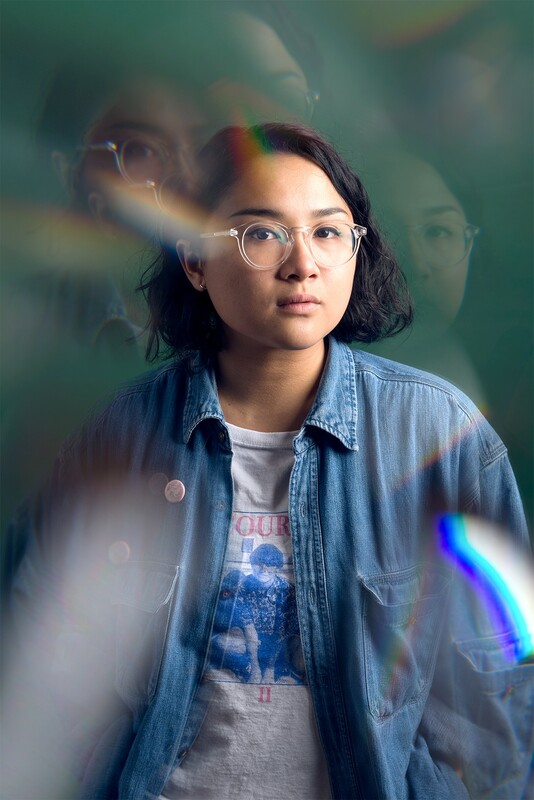 Jay Som, the music project of 23 year-old Melina Duterte. One of Oakland-based musician Melina Duterte’s earliest live sets took place on the brink of a personal breakthrough. It was an opening slot for Brooklyn’s Mitski, an intimate acoustic show at the Swedish American Hall in San Francisco. Duterte, 23, had toured with a full band before, cutting her teeth in Summer Peaks — a band started with a couple of high school pals from her hometown of Brentwood. Still, Duterte, who releases music under the Jay Som moniker, was nervous. “It was the first time I had ever done a solo show for Jay Som,” said Duterte during a phone interview, a day after her set at the illustrious Brooklyn venue Rough Trade NYC. Duterte took the stage at Swedish American Hall, tentative but assured going into her first solo gig as Jay Som. Her good-natured banter on stage belied whatever nerves she might have had that night. That was in February last year. Her latest record, Everybody Works, was released this March to an array of accolades and touring dates, including a last-minute addition to Sasquatch and San Francisco’s Phono del Sol Festival last weekend. Duterte closed her first Jay Som set at Swedish American Hall with “I Think You’re Alright,” a jagged love song that arguably elicited the most excitement among the numbers from her all-too-brief solo set. It had circulated for months on Soundcloud and Bandcamp before Duterte released Turn Into, Jay Som’s informal debut album. The release and immediate outpour of approval for Turn Into is the stuff of indie lore: After a drink too many on Thanksgiving in 2015, she packaged nine demos — some polished, some less so — into a proper album for release on Bandcamp. Turn Into would go on to be released physically to wider audiences twice in the following year, first through a small cassette release via upstart labels Topshelf and the San Francisco-based Wave Dweller. Following the immediate feedback of this original drop — and of “I Think You’re Alright” as a proper 7” single last June on Mississippi label Fat Possum — Turn Into got a full vinyl and CD release on indie stalwart Polyvinyl in November, nearly a year after Duterte published the album online. It would be faulty to suggest that Jay Som’s upward trajectory is purely the stuff of luck, or that her success came overnight. Duterte has been releasing music since 2012 under the Jay Som moniker, which she found through an online generator akin to Donald Glover’s Childish Gambino project. The process of releasing her material to steadily increasing anticipation was always one rooted with a singular focus. As a lifer in the DIY subculture, Duterte accepts the feeling of solitude that comes with creation as a given. She singlehandedly writes, composes, and records her material as Jay Som. She studied music production at the nearby Los Medanos and Diablo Valley colleges to fully familiarize herself with the full recording process and have the ability to engineer and mix her own work. Duterte recorded Everybody Works in a bedroom studio she set up for herself after relocating to Oakland. “It was such a big jump from playing and recording and practicing music for years to actually making it financially viable and touring and rolling with the punches with how fast everything was happening,” she said. It’s a handicraft process that, for better or worse, has shifted into a bigger production as she’s moved up the bill as a touring musician. But even when Duterte reflects on the Bay Area DIY culture, she is pragmatic and self-aware. 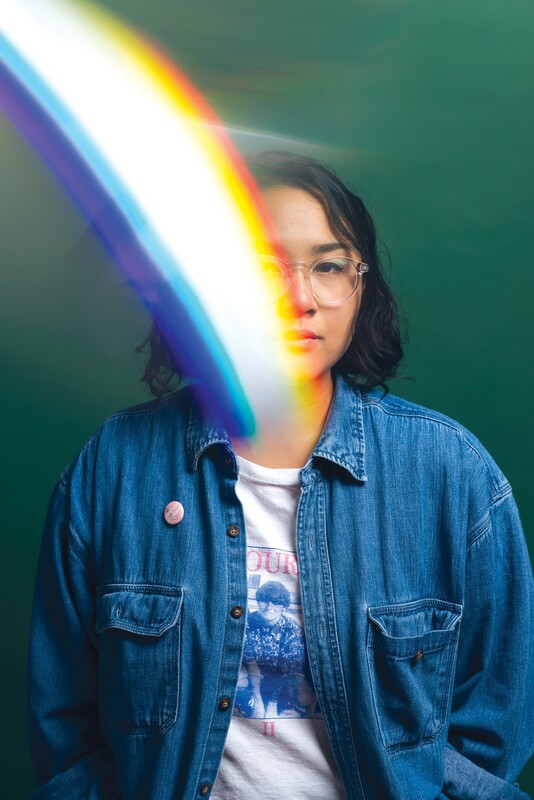 Last year, only months after her gig at the Swedish American Hall, Jay Som embarked on a solo summer tour with Portland’s Japanese Breakfast and Mitski. The trio, a slate of Asian-American women indie rockers, have shifted the paradigm of the genre and its constituent fan bases to encompass a generation of listeners that haven’t been otherwise visible in the genre. It’s a generation that is less interested in upholding the traditional indie hallmarks of elitism and exclusivity, and perhaps more concerned with accessibility and amplifying voices that aren’t heard elsewhere. With this inclusivity comes a greater arena of possibility. From where Duterte stands, her and her peers’ growing resonance goes beyond visibility and extends into new, captivating modes of storytelling and song craft. It’s not hard to see Jay Som, her previous touring companions, and other women and femmes of color making indie rock, like rising act Vagabon, as not only carving out a space of their own, but revolutionizing the form itself. Everybody Works, her first collection of songs intended for release as an album-length statement, embodies this rejection of genre and expectations. It’s a lifetime’s worth of omnivorous musical consumption and creation distilled into a thoughtful and ambitious 35 minutes. The album is especially refreshing in a year where indie acts that are positioned squarely into the broader mainstream seem to wear stylistic shifts like fast-fashion trends, with the likes of Arcade Fire and Dirty Projectors using the signifiers of R&B and pop music as mere window dressing. What’s truly remarkable about Everybody Works, which has garnered acclaim from music publications like Pitchfork and Spin, is the sonic cohesiveness she maintains throughout. The lilting breathlessness of opener “Lipstick Stains,” the tropicalia-tinged shuffle of “One More Time, Please,” and even the shoegaze clinic she puts on in “1 Billion Dogs” all bleed into each other, never settling into a complacent groove. “I went back to listening to music that made me fall in love with making music,” said Duterte of what she surrounded herself with while making Everybody Works. Everybody Works, more than anything Jay Som has ever released, looks outward to the ties Duterte has formed. Its literal meaning, which evokes practicality and sacrifice, is reflected in the album’s titular song, an anthem for disaffected, worn-down young adults. The saying serves double-duty as a universal mantra for hard times, inspired in large part by the financial distress Duterte and her close friends were facing during the recording process for Everybody Works, and how that played its part as she traversed through her own young adulthood. But for her, the phrase is better meant to capture the unspoken forms of work. It’s the labor and self-care required to improve and sustain yourself as an empathetic person in a culture that tends to only understand productivity through the lens of economic wealth. “It’s mental health and even relationships, platonically and with your family. It’s working on that,” Duterte said. Over a year after the show at the Swedish American Hall where she, in her own words, “was freaking out,” Duterte has bloomed into a musician fully aware of the strength of her work and of her roots. She’s headlining shows now with a full band, wrapping up a tour with the Courtneys, and after a brief summer hiatus, re-upping again with a fall tour in September. Every homecoming show now feels like a celebration, even the ones that come from left-field — including an opening set with Andrew Bird at the Mountain Winery in Saratoga. Jay Som will play at the Mountain Winery in Saratoga on Friday, June 30. Find out more at JaySomMusic.com.